TIMESAUSTRALIA, SITUBONDO – The grief news for Muslims. 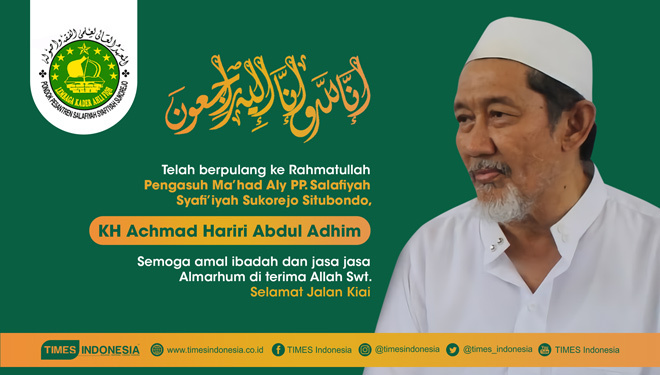 KH Achmad Hariri Abdul Adhim, passed away on Wednesday (11/7/2018). He is a Caregiver of Ma'had Aly, Islamic Boarding School Salafiyah Syafiiyah Sukorejo, Situbondo, East Java. The figure of the Kiai Hariri was the figure of the istiqamah cleric who educated santri in Ma'had Aly Sukorejo. The grief news was also conveyed on the official Facebook account of the Salafiyah Syafiiyah Sukorejo Islamic Boarding School in Situbondo in which also spread out on social media such as WhatsApp (WA). "He has been passed away," said H Abul Wahid, the family of KH Hariri, who lives in Bululawang, Malang Regency, to TIMES Indonesia (timesindonesia.co.id). As a Caregiver for Ma'had Aly, Kiai Hariri continues to provide guidance to students who study at Ma'had Aly. Especially tausiyah or advices about giving service to the pesantren community. Ma'had Aly is an educational institution under the auspices of the Salafiyah Syafiiyah Sukorejo Islamic Boarding School, which is currently cared for by KHR Ahmad Azaim. Kiai Hariri is also the Mudir Amm of Ma’had Aly. When giving tausiyah to the santri (students in pesantren), Kiai Hariri conveyed to the santri if they have to socialized in the community, they had to apply the knowledge that had been obtained during study in the pesantren.